When you think about Iceland, if all you imagine is drinking expensive beer in a Reykjavik bar and visiting the local nature baths for half an hour, think again. Hop to the North side of the country and you’ll find landscapes among the most breathtaking in the world. Stunning fjords, beautiful coastal highways, waterfalls of the gods, epic volcanoes, snowy mountains, hot springs and natural baths a plenty. North Iceland squeezes in more geographical wonders than seems physically possible. It doesn’t stop there. Quaint historic fishing settlements nestle beside fjords, oozing with character and gastronomic delights. They await explorers seeking adventure. Once isolated fishing communities on the edge of the world, they now host the finest eateries, craft breweries, luxurious spas, and boutique hotels. 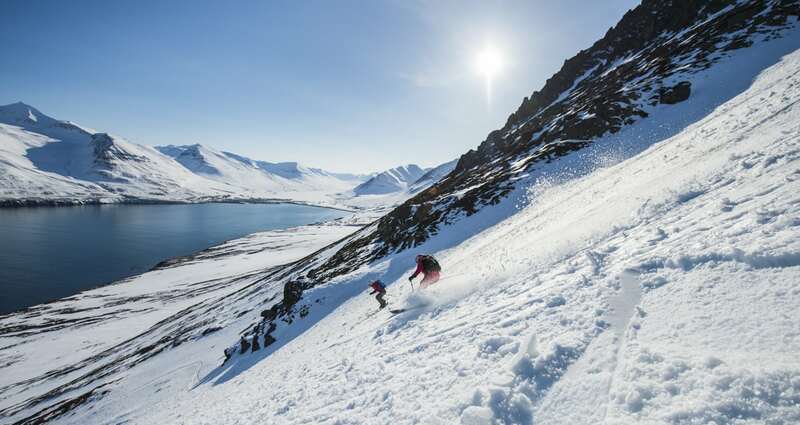 Visitors will find ski areas seated above open ocean, whale-watching tours in the fjords, and dozens of locally run excursions allowing nature lovers access to the otherworldly wilderness. In fact there are more tours and attractions in the North than any other region in Iceland. 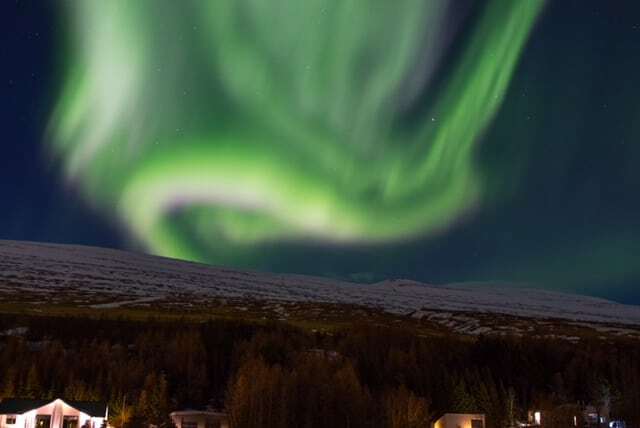 What’s more, visitors have higher chances of seeing the mesmerising Northern Lights here too. 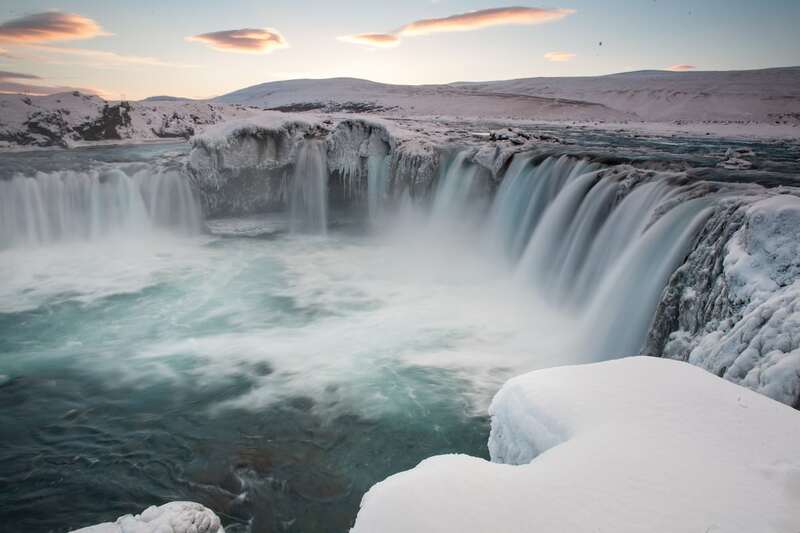 The London Economic sent one of our writers to find our more about this undiscovered gem during their Icelandic Winter Games weekend. 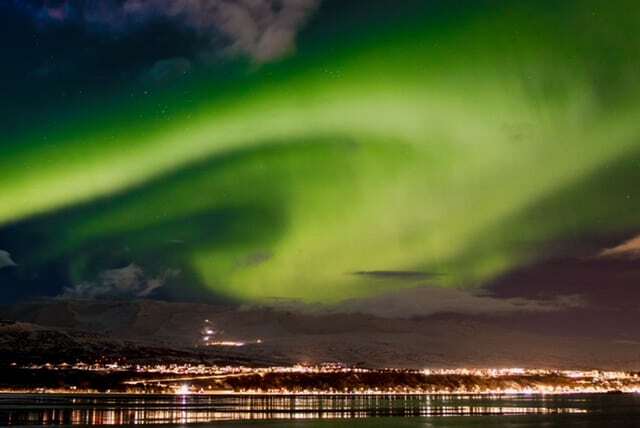 The stunningly beautiful town of Akureyri is the gateway to the North. You can arrive by road, air or even by sea. Iceland Air and Wow Air run daily flights from many of the UK’s regional airports. The majority of flights land at Keflavik, Iceland’s major international airport just outside of the capital Reykjavik. However, direct flights to Akureyri from the UK are popping up with increasing regularity. Super Break is offering 3-4 night trips to North Iceland (which they call Incredible Iceland) flying direct to Akureyri. We flew from Heathrow to Keflavik. After the short two and a half hour flight, arriving travellers can opt to hire a car and road-trip to the North, or even catch a bus. However, if you’re time limited it’s easier to take a 30-minute internal flight to Akureyri (round trips from around £150). Flights to Akureyri depart up to a dozen times a day from Reykjavik airport, a tiny airport close to the centre of Reykjavik. It takes just over half an hour to travel from Keflavik to Reykjavik airport. The scenery from the air is jaw dropping. 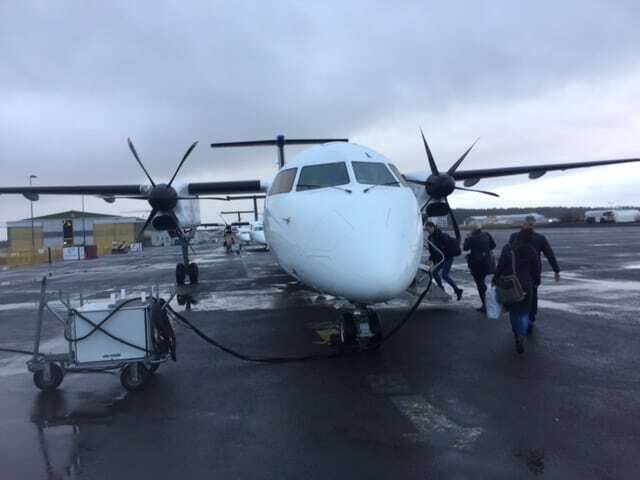 Flying to Akureyri is an experience in itself. After the hustle and bustle of Keflavik airport, Reykjavik airstrip is positively charming. And absolutely tiny. We felt like explorers climbing into the small twin-engine plane that would be at home on an Indiana Jones set. After half an hour of soaring across the incredible Hoth-like Iclandic tundra, the tiny twin engined aircraft swooped down towards a fjord and for a moment I feared we were landing in the water. In fact, Akureyri ‘international airport’ is a strip of volcanic tarmac running alongside Eyjafjörður fjord. The airport is just a few hundred yards from the town. 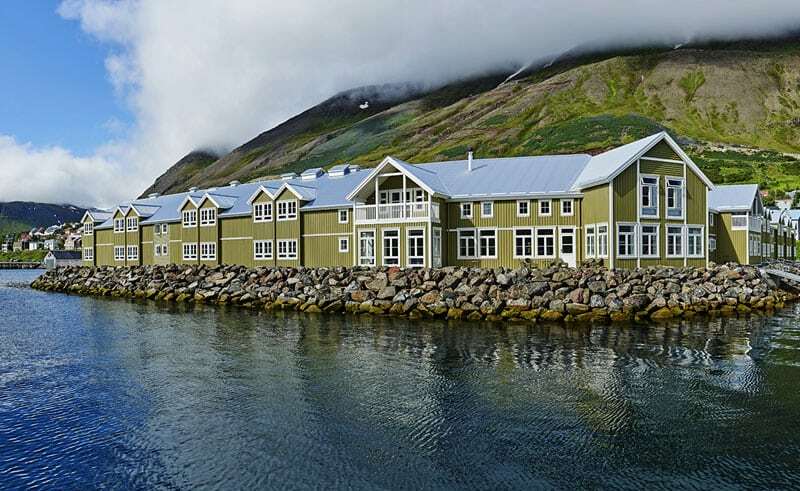 Such is the proximity of the airport to the town, we decided to walk along the newly constucted fjord-side walkway to our hotel, passing the pretty multi-coloured fisherman’s houses that have been present in the town for 150 years. We made our way to our base for the first three nights, the Icelandair Hotel, a swish modern hotel seated just above mainstreet. After dumping our bags, we wandered down to the quaint town centre and opted to dine in Striked Restaurant & Bar, which enjoys panoramic views of the fjord. We feasted on delectable Tuna carpaccio and the freshest locally landed cod you could wish for. We already sensed we were in for a treat in North Iceland. After breakfast at our hotel we met our tour guide Armann from local tour company Saga Travel (not related to the ‘mature’ Saga travel brand in the UK). We had booked onto the Classic Lake Myvatn Wilderness Tour (prices start from 17,900 ISK, approx. £130). The hilarious Armann entertained us with Icleandic stories, local legends, and jokes (mainly at South Iceland’s expense). The drive took us high above the Eyjafjörður fjord, with views of the the ocean and the high mountain tops. We stopped at the incredible Goðafoss Waterfall (waterfall of the Gods) before heading onto Lake Myvatn where we explored volcanic craters, mud pools, table-top mountains, lava fields, and techtonic rifts. The illimitible landscape has served as a filming location for major Hollywood films and TV shows, such as Game of Thrones and Star Wars. 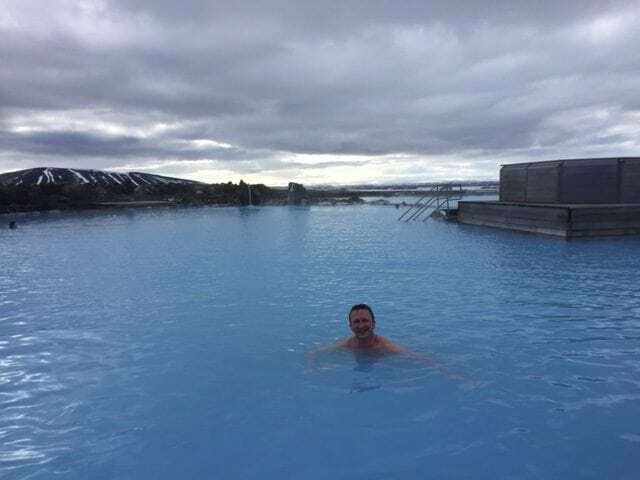 After exploring natures wonders, we visited the relaxing geothermal lagoon Myvatn Nature Baths for a long dip in the steaming, colbolt blue waters. An absolute must if you are visiting Iceland. 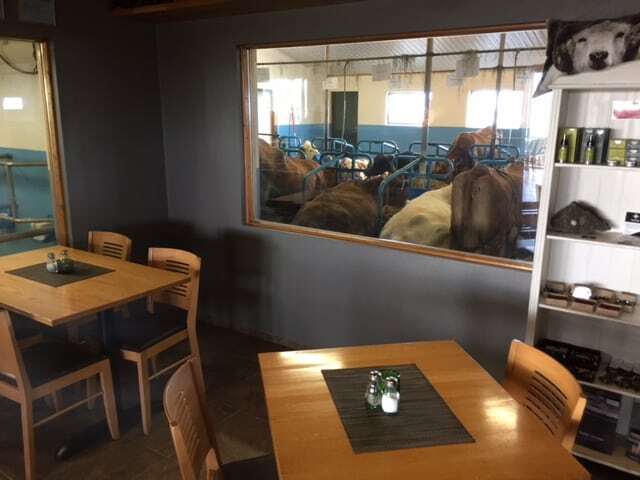 For lunch we stopped at the unique Vogafjós Cowshed Cafe & Restaurant where we ate fresh mozzarella whilst watching the cows being milked from inside the restaurant, only separated by an internal window. 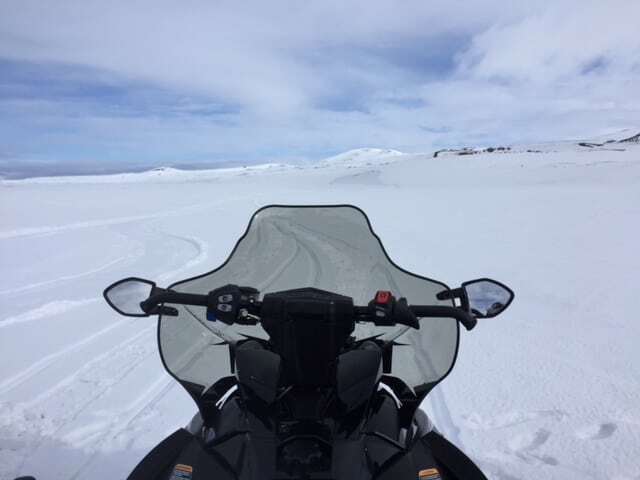 Once we had thoroughly relaxed and indulged ourselves, I took the opportunity to hop onto a two hour Snowmobiling tour by the Lake with www.amazingnorth.is (prices start at 22,500 ISK, approx. £160 for a two hour tour). Local ex-fisherman, Dori, took me on a high-speed exploration though some of the wildest landscapes I’ve ever had the privilege of visiting. We stopped at various points to take in the geographical interests and marvel at the silence. A rare treat in a modern world. You really get the sense of being in the arctic circle, which actually starts only a few miles away from here. Dori and Amazing North run tours to suit every individual. Famished following a day of activity, we almost crawled into Múlaberg bistro & bar on our return to Akureryi. We tried a starter of Auk, a delicious local seabird, which tastes like a cross between beef fillet and pigeon breast. Then we ate probably the most divine lamb I’ve ever tasted. Enough said. Renourished and fulfilled, we made our way to Mt. Hlíðarfjall (a ski area just a few minutes from Akureyri) to watch some of the Icelandic Winter Games. The snowmobile drag racing was taking place under the floodlit slopes. This is high-octane and fascinating spectacle is one that you’d only imagine watching inside the arctic circle. Then, again, you remember you’re only 25 miles away. The next day we decided to return to Mt. Hlíðarfjall to try out the wintersports in Iceland for ourselves. Skiing in Iceland has a lot to offer. Whilst the ski area is small by European standards, it is stunningly beautiful with views of the town, fjord and open ocean below. There’s also a verity of slopes for beginners and experts (with great access to off-piste areas). Such is the close distance from the town, the ski area is phenomenally accessible and would be perfect for weekenders who fancy a spot of snow sport in-between the scores of other activities on offer. It’s also perfect for families with learners on board. We popped back into town for lunch at the family restaurant Greifinn where we shovelled down sublime burgers, fries and hot-wings, before heading up to the mountain to take in more of the Icelandic Winter Games. We watched the jaw-dropping snowmobile snowcross event (big-air a plenty) and then headed over to the high-speed downhill mountain biking, where riders race at eye-watering speeds down the ski slopes. Later in the afternoon we tried our hands at ‘Sled Dogs’ – a relatively new snowsport that is a mix between skiing and skating. The inventor of the Sled Dog, who was present for the World Championships later in the evening, told us that it’s easier to learn than skiing or snowboarding. It’s also a good introduction to skiing. He was right – after half an hour we were whizzing down the slopes like experts (we thought). That was until we actually saw the experts flipping off jumps and taking on the slalom in the championships. In the evening we went to trendy restaurant RUB23 for dinner. Iceland is famous for its fish, so it makes sense that sushi has taken off in a big way. Here, we had some of the most delicious sushi we’ve tasted. The ‘sushi pizza’ is an absolute delight. After devouring the sushi pizza, we strolled down to the waterside and caught one of the most spectacular natural wonders I’ve ever witnessed. The Northern lights were out in force, dancing across the sky in green, white, purple and red. Photos cannot do the display justice and it’s hard to describe what we saw, so I dare not even try. You need to see the Northern Lights in Iceland for yourself. From Autumn to Spring, visitors have a 60 per cent chance of witnessing the aurora during a three night stay in the North of Iceland. To increase your chances you can book local tours that take you out to the wilderness, away from any light pollution. 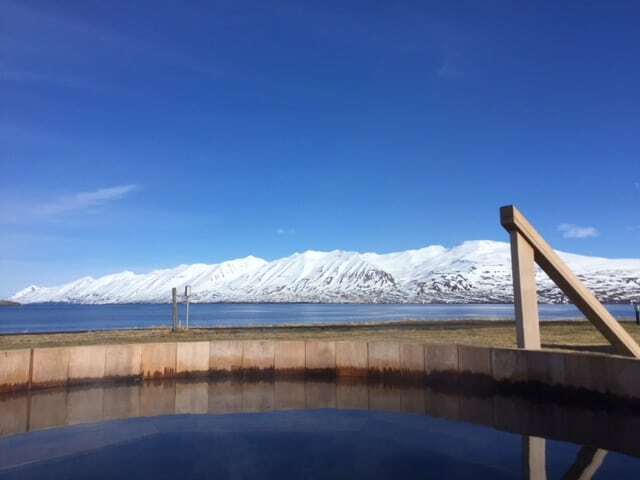 Two days of active exploring left us in the mood for some pampering, so we took the beautiful car journey forty minutes down the fjord to Bjórböðin Beer Spa – The first Beer Bath in Iceland located in the first microbrewery in Iceland. Now, don’t be fooled. Beerbaths, or bathing in a bath of beer, may sound like a laddish pursuit, but this is one of the most luxurious spas you could hope to discover. 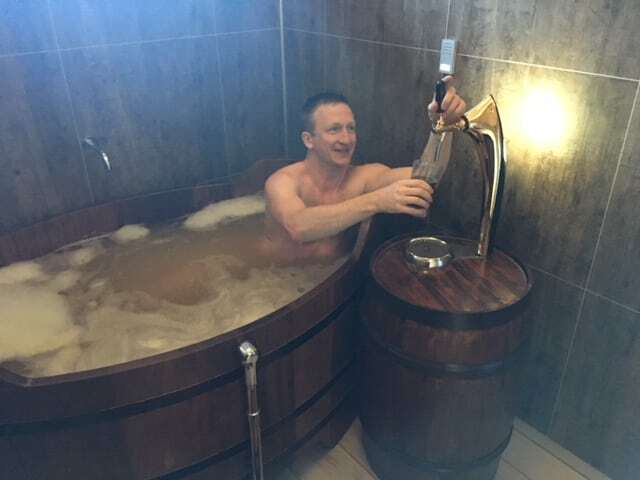 It turns out that ‘young beer’ is incredibly good for your skin, so what could be better than soaking in the stuff with your own personal beer tap on hand? Once you’ve absorbed enough beer, orally and through osmosis, you can spend time in the fjordside hot-tub and sauna where visitors and staff can regularly spot whales and other marine life across the phenominal vista. Fully pampered, we headed to the spa’s restaurant to once again dine on sublime fresh fish with a creamy beer sauce, accompanied by a tasting platter of craft beers brewed on location. Spa lovers or craft beer enthusiasts will be equally at home here. We came away feeling utterly refreshed and satisfied, so we headed to the ski area in Siglufjörður, another small but utterly stunning ski area nestled above the fjord. 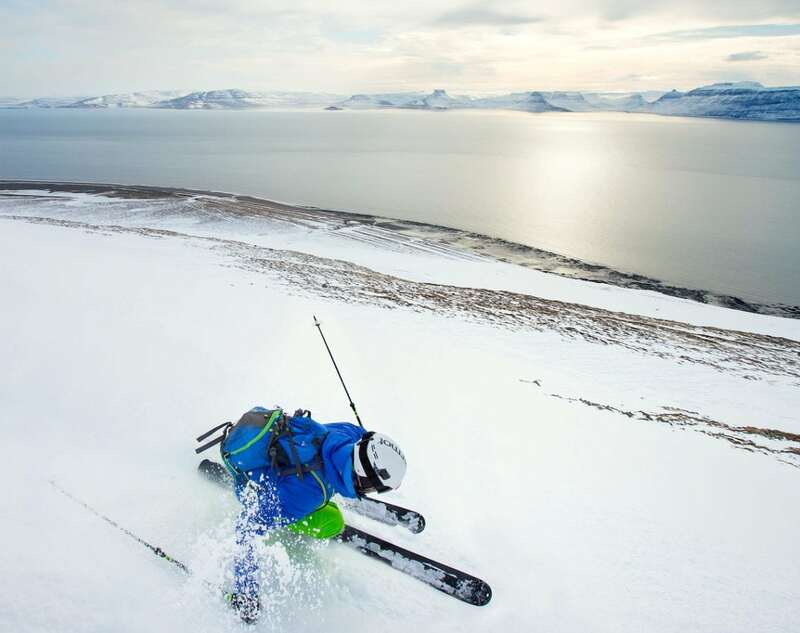 North Iceland is dotted with these picturesque ski fields and it’s possible to buy a pass allowing visitors to explore all of them. 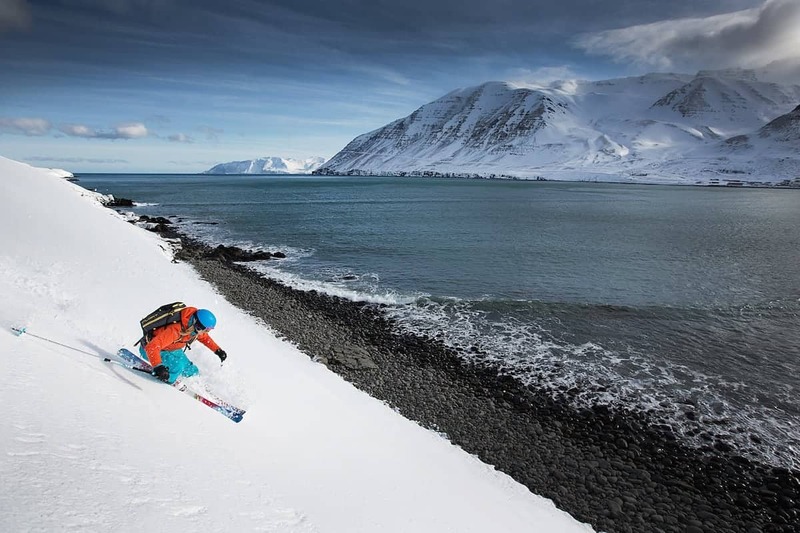 The 5×5 Ski pass (available from www.skiiceland.is is a ski pass that serves all of North Iceland resorts. This means that you can ski in five resorts for five days. If you want to ski at one resort for four days and then do another one for one day that‘s fine. You get the idea. After a couple of hours on the slopes we headed back down the hill to the Sigló Hótel in Siglufjörður. Many people describe the Sigló Hótel as the best hotel in Iceland, and it’s easy to see why. The hotel is deluxe on the inside, but it’s the exterior that will take your breath away. 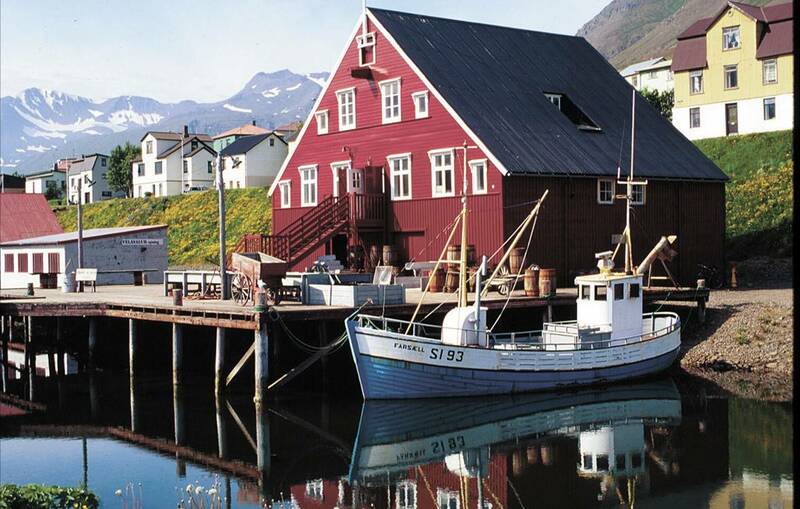 It sits within the harbour of the tiny and mesmerising fishing village of Siglufjörður. 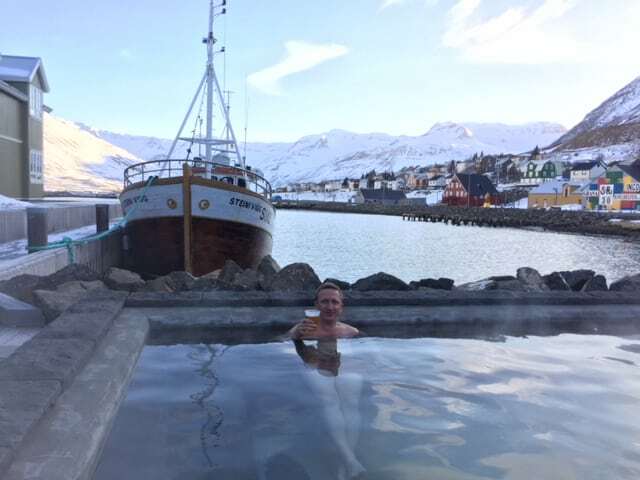 Whilst enjoying the outdoor waterside spa, guests can watch cod fishing boats unloading the day’s catch beside the colourful fjordside houses and historic fishing warehouses. All this with a staggering view of the fjord, stretching endlessly into the distance beneath the snow-capped mountains. 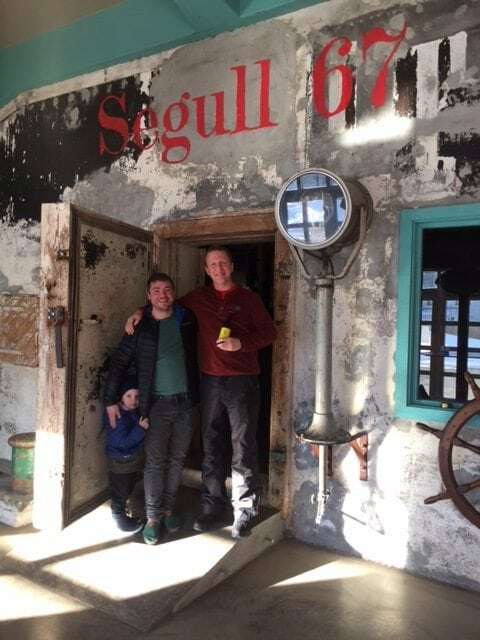 Feeling invigorated once more (and that we had room for more beer) we strolled around the harbour to a historic fish warehouse that been lovingly restored into a family run craft brewery – Segull 67. Marteinn Brynjólfur Haraldsson one of the family members and owners, gave us a tour of the brewery where we sampled their splendid IPA and Easter ale. It’s well worth a visit; aside from the quality beer, you’ll get a taste of the heritage of Siglufjörður. That evening we dined in the Sigló Hótel discovering that it was the location for Trapped, the Icelandic crime drama aired on the BBC. After dinner we went back to the outdoor spa with our drinks and gazed at the stars above the mountain peaks, listening to the sounds of the fjord, and hoping to catch another glimpse of the wondrous aurora. And we did. Before we headed back to Akureyri we decided to take the scenic route and visit Hofsós public swimming pool for a morning dip. 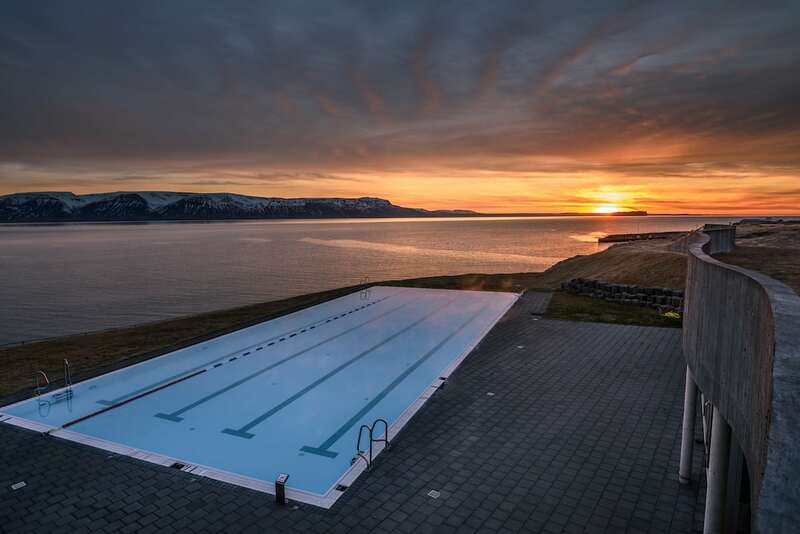 This is one of the many incredible swimming pools you’ll find in Iceland. The pool donated to the town in 2010 by businesswomen, Lilja Pálmadóttir and Steinunn Jónsdóttir. Geo-thermally heated, open-air, and on the side another fjord – you couldn’t hope for a better way to clear the head after a little too much craft beer and local gin from the night before. You can’t even check in to Akureyri airport until 45 minutes before the flight, so what’s the rush! It was finally time to make my way back to Keflavik. With Led Zeppelin’s Immigrant Song stuck in my head, my overwhelming feeling was sadness to be leaving this astonishingly beautiful and welcoming country. I almost couldn’t believe that this Narnia is just 2.5 hours from my home, and I’ve never been here before. The landscape is spectacular, which I expected. What I did not count on was the sumptuous food, brilliant facilities, and charm of the natives. Not only do I want to come back here as soon as I can… I want to live here. Iceland’s entire population is just 340,000, yet almost 2.2 million tourists arrived to the island last year. Most visitors stay in the South-West of the country around Reykjavik and despite the Icelandic tourist boom continuing, the North remains the new frontier. There is so much to see and do, suitable for every type of group, family and individual. But, what makes this place even more special is the pride of the locals. They are taking every step to ensure that tourism here is sustainable and as low impact as possible. Friendly as the locals are, they are descendants of Vikings; don’t even think of coming here if you aren’t planning on respecting their lands. If you would like to visit North Iceland, discover more here.